Thanks to Rozenfeld for posting the link. A series of studies have documented how Steppe pastoralist-related ancestry reached central Europe by at least 2500 BCE, while Iranian farmer-related ancestry was present in Aegean Europe by at least 1900 BCE. However, the spread of these ancestries into the western Mediterranean where they have contributed to many populations living today remains poorly understood. We generated genome-wide ancient DNA from the Balearic Islands, Sicily, and Sardinia, increasing the number of individuals with reported data from these islands from 3 to 52. We obtained data from the oldest skeleton excavated from the Balearic islands (dating to ~2400 BCE), and show that this individual had substantial Steppe pastoralist-derived ancestry; however, later Balearic individuals had less Steppe heritage reflecting geographic heterogeneity or immigration from groups with more European first farmer-related ancestry. In Sicily, Steppe pastoralist ancestry arrived by ~2200 BCE and likely came at least in part from Spain as it was associated with Iberian-specific Y chromosomes. In Sicily, Iranian-related ancestry also arrived by the Middle Bronze Age, thus revealing that this ancestry type, which was ubiquitous in the Aegean by this time, also spread further west prior to the classical period of Greek expansion. In Sardinia, we find no evidence of either eastern ancestry type in the Nuragic Bronze Age, but show that Iranian-related ancestry arrived by at least ~300 BCE and Steppe ancestry arrived by ~300 CE, joined at that time or later by North African ancestry. These results falsify the view that the people of Sardinia are isolated descendants of Europe's first farmers. Instead, our results show that the island's admixture history since the Bronze Age is as complex as that in many other parts of Europe. Huge finds in this study!!! "The presence of Steppe ancestry in Early Bronze Age Sicily is also evident in Y chromosome analysis, which reveals that 4 of the 5 Early Bronze Age males had Steppe-associated Y-haplogroup R1b1a1a2a1a2. (Online Table 1). Two of these were Y- haplogroup R1b1a1a2a1a2a1 (Z195) which today is largely restricted to Iberia and has been hypothesized to have originated there 2500-2000 BCE57. This evidence of west-to-east gene flow from Iberia is also suggested by qpAdm modeling where the only parsimonious proximate source for the Steppe ancestry we found in the main Sicily_EBA cluster is Iberians (Supplementary Table 14)." This makes the Sicani descendants of Iberian migrants myth very plausible now, plus there is autosomal evidence, I guess it was retained memory over millenia. "Finally, when we model modern Sicilians, we find that they require not only Steppe and Iranian- related ancestries but also North African ancestry, confirming the ample historical and archaeological evidence of major cultural impacts on the island from North Africa after the Bronze Age (Supplementary Materials)." Hmmm looks like I was right this whole time along with many others who obviously saw this coming! "Most Sardinians buried in a Nuragic Bronze Age context possessed uniparental haplogroups found in European hunter-gatherers and early farmers, including Y-haplogroup R1b1a[xR1b1a1a] which is different from the characteristic R1b1a1a2a1a2 spread in association with the Bell Beaker complex4. An exception is individual I10553 (1226-1056 calBCE) who carried Y-haplogroup J2b2a (Online Table 1), previously observed in a Croatian Middle Bronze Age individual bearing Steppe ancestry44, suggesting the possibility of genetic input from groups that arrived from the east after the spread of first farmers." I find it interesting that they found a J2b-L283 amongst the Nuragic Culture, I am curious if it will belong under Z597 branch or it will be part of the pre Z615 branches that are seen on Yfull. Very interesting find indeed, L283 even in modern Sardinia is very interesting given the fact that multiple basal clades are found there. How can I see the Y-DNA haplogroups found? There is 5 J's from the paper with at least one J2b-L283 from Sardinia and one J2a from Bronze Age Sicily the other 3 are low coverage. Also pretty exciting is that the G subclade of Bronze Age-Iron Age Sicilians seems to be Z1903 which is crazy because before the Iberian paper which has 1 sample in CHL it has only been found in Bulgaria CHL, and we have a specific branch of Z1903 which is Z3428 in these samples. It is on the page, it took me time to find it I think the L283 will be one of those pre Z615 branches. In the Sardinian_LateAntiquity group (the earliest dating to 256-403 calCE), we detect even higher proportions of Iran_Ganj_Dareh_Neolithic-related ancestry: an estimated 29.6 ± 4.6.% (p=0.000001 for rejection of the alternative model that attempts to model its eastern ancestry as entirely Yamnaya-related, Supplementary Table 9). One possibility is the Iranian-related ancestry began to be introduced in the Phoenician period, a scenario that is not only consistent with the historical evidence and our finding of this ancestry type in the Iron Age Sardinian, but is also supported by previously published mitochondrial DNA which has documented haplotypes in ancient Phoenician colonies in modern Sardinians. 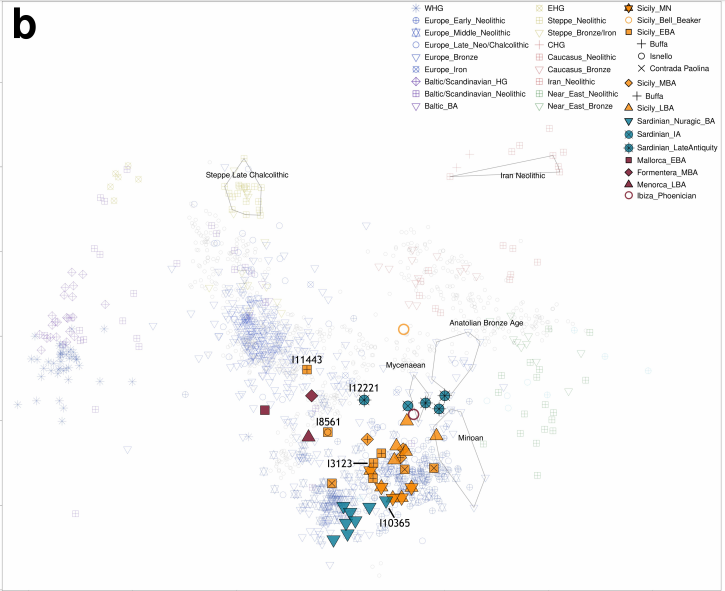 It is striking that most of the ancestry in modern Sardinians is inferred in this analysis to come from a Sardinia_LateAntiquity12221-related group, which can itself be modeled as closely related to Mycenaeans or Phoenicians with no evidence of specific shared ancestry with Bronze Age Sardinians. The group of modern Sardinians we are modeling has often been interpreted as an isolated lineage that derives from early Sardinian farmers with little subsequent immigration into the islands. Our finding that a large fraction of this group’s ancestry is consistent with deriving from a group that was present in Sardinia in Late Antiquity and that had no evidence of a contribution from earlier Sardinian groups is therefore surprising (although we caution that this inference is tentative as the amount of data we have for Sardinia_LateAntiquity12221 is limited; Online Table 1). Modern Sardinian populations are geographically highly substructured for example among different valleys and coastal and inland sites.55 Analyses of more geographically diverse modern and ancient Sardinians will provide additional insight into the population turnovers. We find no evidence of Iranian-related ancestry in the Balearic Islands individuals until the Phoenician period, around the same time as we detect it in Sardinia. In Sicily, Iranian-related ancestry was present during the Middle Bronze Age, showing that this ancestry which was widespread in the Aegean around this time (in association with the Minoan and Mycenaean cultures), also reached further west. Based on our analysis of modern individuals, it is possible that this ancestry first spread west in substantial amounts during the Late Helladic period of the Mycenaean expansion when strong cultural interactions between Sicily and the Aegean are documented18,60–62. However, if our signal of such ancestry in an Early Bronze Age Sicilian individual is correct then some of this spread began even earlier. Fascinating stuff, there's much to bet the Phoenician settlers in Sicily also resembled the Sardinian_LateAntiquity samples . Last edited by Agamemnon; 03-21-2019 at 04:44 PM. Aren't the J2a and J samples from Bronze Age Sicily listed as being contaminated? Yeah your right, I guess when the bam files become available we'll find out. One them isn't actually listed as contaminated and was used, this is one of the J no further calls sample (I7796). Last edited by Principe; 03-21-2019 at 04:51 PM. How to determine source of stubborn west Mediterranean DNA signature?